Imagine you’re a big American publisher, and there’s a book infamous for its subject and language that you want to publish — but first, you have to go up against the US government to prove it should no longer be banned. And, given the publicity of the court case, you want the book in the bookstores as soon as it’s legal. This describes the situation facing Random House in 1933 as they waited to publish James Joyce’s Ulysses, which had not been allowed into the US for 12 years. How they got the ban dropped and delivered the book at just the right moment is a short tale of legal, design and production choreography. In 1934, a confluence of US legal, literary and cultural history (not to mention American book design and commercial publishing) produced the first legitimate US edition of Joyce’s Ulysses. The novel had begun serialization in 1922 in the Little Review magazine when US postal authorities seized several issues because they contained obscene material. Once banned but published abroad, copies were covertly brought back into the states by many Americans. In March 1932, Bennett Cerf, then president of Random House, signed a contract in Paris with James Joyce, responding to Joyce’s desire for an authorized and corrected text published in America that could establish his copyright. Random House intended to precipitate a court case to get the ban overturned. Understandably, Random House wanted books for sale as soon as the ban was lifted. There were two options: the first, being to publish, sell, and wait for the lawsuit sure to come — which would prove enormously expensive if they lost the lawsuit. Alternatively, at the direction of Random House, an existing copy of the book was sent from Paris to Cerf into which copies of positive comments and critical reviews were pasted (to make sure they would be presented as part of the court evidence). The publisher informed the Customs officials of the book’s arrival in April, to ensure it was opened and seized. With the announcement of the verdict, Cerf ordered a first print run of 10,300 copies to be ready by January 25, 1934, selling for $3.50 apiece. How would they manage that? During the long wait for legal resolution, Random House had commissioned the interior, binding and jacket design from Ernst Reichl who worked for H. Wolff Manufacturing (one of the largest book producers at the time). Ernst Reichl came to the US in 1926 with an art history PhD, and experience in book publishing and design in Germany. He was a ‘whole book’ designer, believing in the harmonious totality of the package and the value of one design vision for all its parts. He would rise to become one of our top book designers, prolific and award-winning, actively promoting the profession and high standards in book design from the 1940s into the 1970s. Five minutes after receiving word of the legal decision, the book went into full production and arrived in bookstores on schedule. The serious effort to produce a correct text was foiled. Rather, as the James Joyce Society website reports, the editors were fooled by a pirated edition printed to look exactly like the Paris edition, even with the Shakespeare & Company name included. This, however, was the careless product of an irresponsible typesetter who committed numerous errors which would not be corrected until the 1940 Random House edition. Reichl called Ulysses “the best known design I ever made” and reported that Merle Armitage showed the title page in a slide lectures “to indicate [a] break with tradition.” Armitage would go on to use the two-page and large scale concept in several of his own book designs. According to Reichl’s notes from 1973, the interior design remained in print until the '70s. In the end, Ernst Reichl and Random House produced a book celebrated for the content and the style of its writing, presented in a restrained design orchestrated on the jacket, title spread and part opener pages. Following changes in marketing and production over time, the jacket/cover was repeatedly replaced, but always with an echo of original, until it returned in 2002. A great story to reminds us of the myriad events which take place in a design endeavor (most of which usually occur behind the scenes). I would think that this way of thinking ahead, clearly embedded in Reichl's systematic approach, probably helped Random House become what it is today… and we can learn from it. As always, thanks for a great read Martha! Glorious, glorious article and images. Thank you for this early holiday gift. I love a good tale of intrigue! Fabulous retelling--thanks so much. I just read a very similar though extended account of Cerf's activity (with lawyer Morris Ernst) to get Ulysses' reviews in as court evidence in Ted Bishop's Riding with Rilke (115-118, 2005). Bishops also talks about the competing designs and layouts of all the versions of Ulysses. Love the Prohibition Repeal angle. Salut! and thanks for an interesting article. Yes, Ernst is the father of Ruth. Glorious, glorious article and images. Thanks you for this early holiday gift. ahh the writer of this article is my typography teacher next semester! I had known that Ulysses had a hard time being published in the United States, but did not know that Random House took such specific steps to try to publish it. Thanks for telling the great backstory to a great book, Martha. Enjoyed reading this! Thanks for drawing my attention to new information on the design elements of 'Ulysses' editions, especially to the Paul Renner potential influence on the late cover. I wonder if you (or another reader) have ever come across any explanation for why Reichl name (which appears in the bottom right corner) on the dust jacket is not reproduced in later printings of the editions? No other elements of that design seem to be altered. Probably some legal or financial reason. Thanks, too for the plug of my bit for the NLI's Joyce exhibit. Glad that was of some interest. Great read, Martha!! It's amazing to think this design was executed under such stressful conditions—especially when you consider the method of production at the time. And I very much enjoyed the images in the slide show. I think I might have to find this gem in our library and explore some more. Its inspiring to see one of my most valued mentors as a students at NC State still practicing at such a high level! 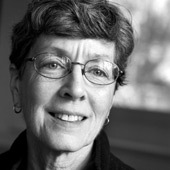 Martha Scotford taught design and design history at the College of Design, North Carolina State University. Ernst Reichl, one of the top book designers of the 20th century, was also a prolific writer who wrote more than 550 comments on his book designs.